I think you will find that the 647 is about to take up service after leaving Stamford Hill depot as the normal 'U' turn made by trolleys terminating at Stamford Hill was ahead of the location shown. I remember as a lad being surprised to find a 679 starting from Stamford Hill to take us northbound in the early hours of the morning having arrived on a 290 night bus. Was this just lazy blind work or was it a booked working. I have often wondered. Kudos for an excellent site which I have visited many times. I was born at the Angel, Islington  and lived in North London between Newington Green and Dalston Junction. My tram/trolleybus rides were through some pretty gritty areas - Angel, Dalston, Hackney, Cambridge Heath and Shoreditch. To this day, I vividly remember catching the 647 at Dalston, through Shoreditch, Aldgate, Leman Street and to it's grim and desolate terminus in Dock Street for the London Docks. None of your straight and wide Uxbridge Roads or tree-lined Croydon streets here! But the trolleybuses were as at home there as anywhere. Thank you again for a wonderful site! The picture of Stanford hill towards Clapton common [from Amherst Park] has hardly changed! The same old bank, you can make out Grodzhinski Bakery. The only change is the cars and the trolleybus overhead. What year was it taken? Judging by the cars the early 60's? Most of the pictures on this site were taken towards the end of operations for particular routes. The date that this picture was taken is unknown, however route 647 ceased on 19 July 1961 so the picture would have been taken on that day or a few days previously. This would probably have been taken in late January 1961. You can see people wrapped up warm and trees with no leaves. 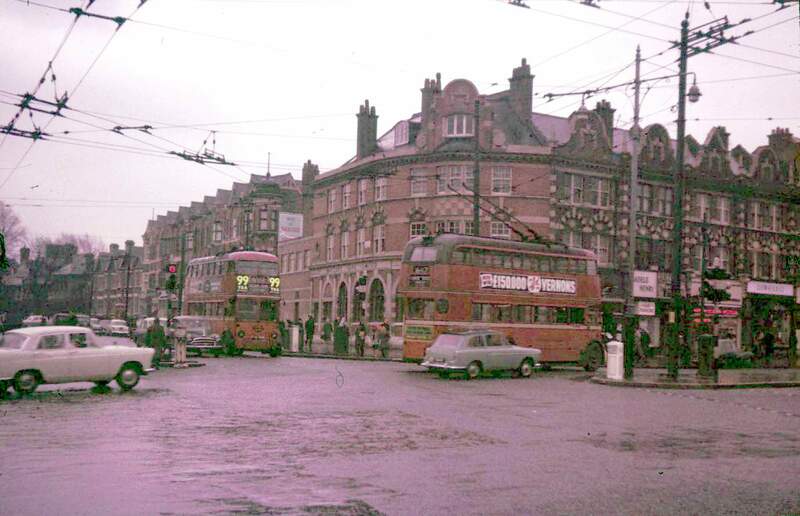 The L3 at Clapton Common is on route 653 [travelling to Finsbury Park Station] which closed on January 31 1961. The wires remained energised for a while as the Q1s came up under power from Fulwell and Isleworth late at nights to Mile End Gate before being towed to London Docks. Fulwell received ex Highgate L3s in replacement which was not a fair exchange, in view of the bad state in which Highgate turned out their vehicles. In the event many were displaced with Finchley L3s [including 1521] when Finchley was converted. That's probably Davis clothing shop behind the 647. Further up is Sainsbury & the library. Don't think that Nash the chemist or the Wimpy Bar were around till couple of years later. I lived on the "Hill" for many years. The picture brings back good memories. Many thanks. I lived in Upper Clapton at the time of this picture. What memories return when I look at the picture; the Gaumont cinema, the salt beef bar, Stamford Hill Boys and Girls Club and being able to walk from Stamford Hill to Clapton at 2am without any fear of being mugged. I had great child and teenage years there, I wish the area was still the same, I live in Oxford now! Have lived in Australia for forty years nice to see where I used to go when I was a little kid.